Produce-wise, this time of year can seem like you need an Ark to ride out the flood of greens- thank God for them. 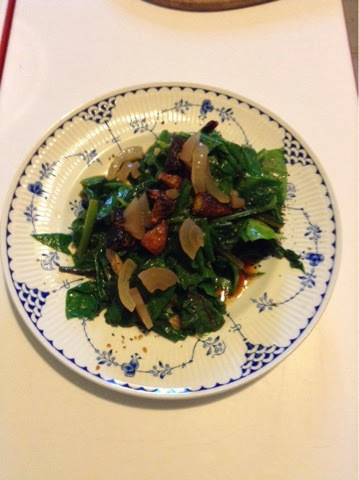 It's spring's compensation for winter's dearth- all the furtive freezer excavations of slimy bok choy and pricey trips to the grocery for bags of wilty California arugula. Suddenly there are collards, kale, ten kinds of mustards, chard, napa cabbage... And all the green-topped root vegetables that beg for their showy flags to be devoured: radishes, turnips and beets. We had a small bag of tiny beets that had been thinned the other day and decided to make a simple wilted salad with a dab of Dijon mustard to offset the leaves' rich minerality. First, I took the marble-sized beets, cleaned them of dirt and put them in a skillet on medium high heat with a tsp of safflower oil. I sautéed them until they just began to brown, five or six minutes, rolling them about in the pan frequently. I then removed them from the heat and dusted them with a pinch of salt and a grinding of black pepper. I washed the beet tops and discarded their tough stems. Then heated a few drops of safflower oil in a skillet on medium heat and added the beet leaves. I tossed them about continually in the oil for four minutes. It would be even better here if you had a piece of bacon that you fried crispy and then withered your greens in the bacon fat. The leaves do very well with the smoke from the bacon. I removed the greens from the heat and added a half tsp of Dijon mustard, a drizzle of tamari, a few drops of good olive oil, one or two grindings of black pepper and a dash of Tabasco. I plated the warm salad and crowned it with the carmelized beets and a few slivers of pickled onion. We used some lovely, sweet pearl onions that Bee pickled a couple of years ago, but it would be easy to make a quick red onion pickle. Just take a sliced medium onion or half a large one and put the slices in a bowl with a couple of large pinches of fine salt, a couple of large pinches of sugar and a tablespoon of vinegar of your choice. Mix all together with your hands, cover and let it sit at room temp for at least a half hour. The onions will mellow if you wait longer and will keep for more than a week in the fridge. This salad would be supreme with a wedge or two of boiled egg- the cooked, creamy yolks mixing with the dressing. Crumble that bacon on top and you've got a meal. Guest Blogging: "The Real Dirt"